Tin O’ Twine is an all-time original, iconic & authentic Nutscene item. If you are looking to buy the perfect gift for a gardener, then look no further! The tin o’ twine keeps your twine tangle-free, safe and dry! The design of the ‘Tin O’ Twine’ label comes from the original Nutscene archive circa 1940. Includes 492 feet of soft, liable and strong BLACK 3-strand garden jute twine. Tin measures 4.5in high and 3in diameter. Has hole in lid to dispense the twine. Nutscene has been involved in the manufacturing and processing of jute garden twines since 1922. First produced in Dundee, Scotland, the birthplace of the jute industry; today Nutscene operates out of a small mill yard in the heart of Angus, Scotland and still winds their twines using the same machinery first used in 1922. 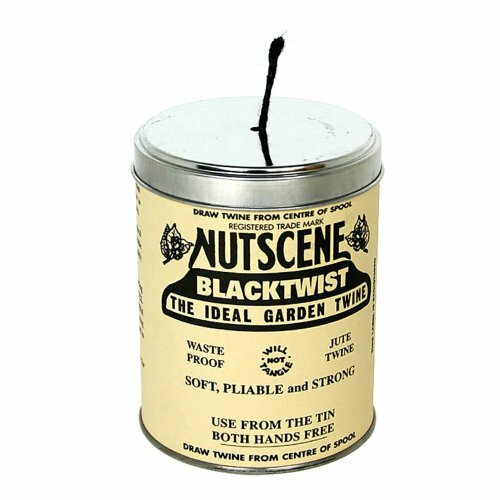 The Nutscene name is derived from their world renowned green garden jute twine which, when tied around the plant cannot be seen, thus “Not Seen” – ‘Nutscene‘. © 2019 - isabellascourt.com. All Rights Reserved.